The interactive google map isn't showing up. When I switch to a static image it works, but I want an interactive map. Also when corrected is there a way to have it fill the whole section I have it in? See API keys in the Google API Console. For more information, see Best practices for securely using API keys. 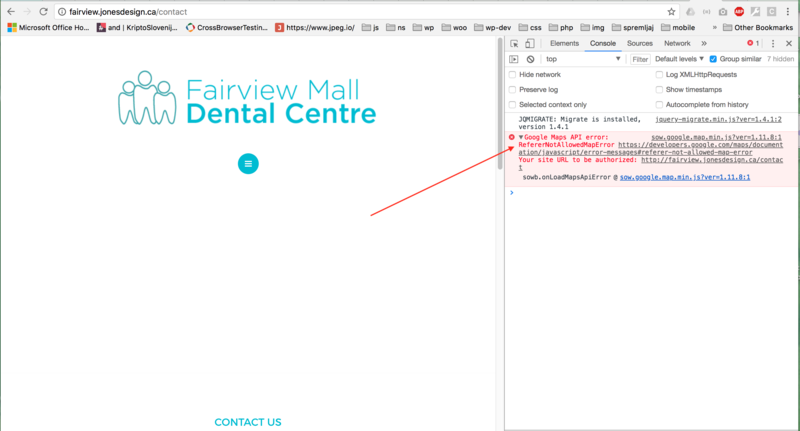 Wrong page, I have it on the home page beside "Dental Packages"
For Google Maps to work, you need a google maps API key. If you already checked your API key settings in Google console, I recommend deleting the key and creating a new one (sometimes Google issues a key, which just won't work for no reason). API keys can be set up here after you're sure everything is set up correctly, just copy the new one into the Google Maps widget. Thanks, I got that all figured out with Google, what a PITA! How do I make the photo of the dentist smaller? The team widget will stretch to whole available space. You can control the size of the widget with the Page builder row. So if you want the dentist to be in the only element in the centre of the row, you can set the row to 3 columns and put the team widget in the middle one. then you can adjust the size of the left and the right (empty) columns as needed. Let me know if this makes sense, or if you need further clarification.